You may recall we have had our Gotta Go Cullect mare Elect To Go racing and on the market lately. We’ve decided to give her a short break after getting a run of bad luck in races or bad draws and only tyre kickers on the market. But that opens up a different sort of opportunity over summer, and Kym and I would like to hear from anyone who would like join us in racing this mare on a lease-to-race basis. We are keen to let her show her potential – a bit like we did with Driving The Dragon last year, who went on to win 5 races in quick order and was sold to Canada, where she continues to perform well! Elect To Go is no slouch – 6 starts for a 2nd and a 3rd, she’s a good size, mature mare and is gaining race day experience quickly. Previous trainer Geoffrey Small says she has a couple of wins in her at short notice and believes she would cope fine on the grass, and she goes either left handed for the Cambridge races or right handed if she shows enough to go to Auckland. We’ve brought her home for a few weeks off, and then Kym will jog her up and start training her and maybe make a couple of starts at Cambridge, with an eye to then passing her to a professional local trainer to take her through the Cambridge/summer country circuit around December/January, which is always a lot of fun. Could be a nice summer of racing at little expense….and maybe a bit more of a return than just that! We are just floating the idea at the moment, so if anyone is interested get in touch – bee.raglan@xtra.co.nz or you can call me of 021 2806569 – to discuss joining a race lease partnership with us, or buy her outright if that suits: she is priced at $5000. 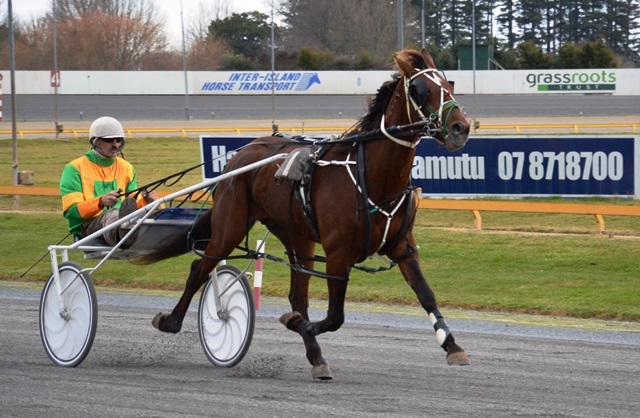 Just a reminder – this 5yo lightly raced mare is closely related to Pachacuti (race 2 tonight at Menangle, awful draw over the mile but this horse is classy, 22 wins out of 44 starts and $202,914), and is a half sister to Sovereign Faith (11 wins, 1:53.6) and Lady Sansa (just starting to race in Australia, a 4th and 2nd already), and her dam is a half to the mare Landeck (Conte De Cristo, 48wins and $246,703; Conte Centovalli, 45 wins and $239,654, etc). So the family has a bit of staying power and ability. Nice breeding, nice mare, nice partners to race with….sounds like a nice summer! I’ll be glued to Trackside TV for the 2yo colts and geldings semi-final at about 9pm tonight NZ Time. Very nice field, and a tough ask for Zee Dana (Tintin In America x Zwish, Dave Kennedy the breeder) – drawn wide, top 2yos drawn inside. I remember when Tintin was racing as a 2yo and Mick Guerin referred to him as a “one trick pony” because as a young horse he appeared to be less a tough staying type and more a “use his exceptional speed” type. But looking back through Tintin’s 2yo racing replays I see much more than that. As a really keen horse, a strong willed horse, part of his education thanks to Geoffrey Small and David Butcher was to make him more versatile – to lead, to take a trail or even (as in the 2yo Sires Stakes Final) take three back, but have the ability to finish it off from wherever he was when they turned for home. His own Breeders Crown was won that way too. I see a lot of that reflected in Zee Dana’s training and racing to date. He has the ability and speed to cross and lead from almost anywhere, but he’s also been allowed to relax and sit in a trail, to learn patience and then making the ultimate effort. It is not easy for a young horse to do, when all they really want is to run and to win. So fingers crossed tonight, as this is a very good field for a semi final. I’m cheering for him and his owners. To make it to the finals would be brilliant. I’m also cheering for Tintin, because he’s got an x factor (always had), and he’s overcoming some big odds as a “less commercial sire” to put up some very classy success stories from his first crop to race. Foal size – who calls the shots? As I touched on in my last blog, we’ve got a good range of sizes of sires now, including several that are only just on 15 or 15.1 hands and some that are over 16 hands. I know that yearlings who are “good size” will catch the buyer’s eye, but my own ignorance about what determines foal size has led me to do a wee bit of research on the topic. Do small sires leave small foals? Do big mares always leave big foals? I’ve always followed the rule that you don’t put a very big sire to a very small mare because of the risks of rupturing the mare or making the birth more difficult, and that you are careful around your choice of sire for a maiden mare. Likewise I’m aware that people recommend a smaller sized sire for a particularly big mare, or at least a sire that seems to leave smaller types. However in practice, finding a sire that leaves a consistent size of foal (big, small or medium) is really difficult. Most of the great ones can stamp in terms of type, but not necessarily in terms of size. Think Bettor’s Delight. Or Courage Under Fire. They often have a certain look about them, but not necessarily size. It’s more common to find a mare who stamps her foals according to size, particularly if she is big. And that’s pretty much what the research seems to show. The foals size is more in the mare’s hands – or rather, in her uterus. But even then, consistency of size is not something sires or mares seem to care about much. Many sires are known for “throwing them all sizes” and mares can be likewise. My own experience with a medium sized mare over a number of foals is an example. Zenterfold’s her first foal (Tintin In America by McArdle, 16h) was a strong, nuggety foal, not tall but with a decent length of barrel and grew to just 15.1h. Next foal was Zenstar (even smaller in size, by Falcon Seelster, 15.3h). Zenterfold also has left a couple of medium sized types (both by Grinfromeartoear, 15.3) and she has also left a tall colt (by Real Desire, 15.2h) who could end up well over 15.3h, plus a very big type to Geoff and Aria Small who was a colt by Elsu – and of course Elsu is only 15.2h himself. So there are no golden rules. Where size does seem consistent, there may be strong enduring family traits (genetic) that are influencing things beyond the immediate match of that mare and that sire. Here’s a readable article that looks at a pretty scientific study about the comparative size of foals from older maiden mares and foals from mares who had bred several foals. Here’s a quote from another article that looks at whether crossing a big with a little means you get a medium…. Let us, for a brief moment, take a step back into history and look at the work of Gregor Mendel. He decided to produce hybrid plants by crossing purple flowered plants with white flowered plants. He also did the reverse. He fertilized plants that produced purple flowers with pollen from a white-flower plant. At that time, one of the prevailing theories was that if plants with opposing colors were crossed, the result would be a plant that was intermediate in color. In the case of the white-flowered plant being crossed with the purple-flowered, the result might have been expected to be a light lavender. Mendel proved that theory to be groundless. He did not get any plants with intermediate coloration with a crossbreeding program. All of this brings us back to our earlier scenario involving the breeding of a short mare to a tall stallion. Genetics will dictate that we won’t get the in-between horse we have been seeking. The offspring would have inherited one or the other of the parent’s genes for growth. If it received the mare’s gene for growth, the offspring will likely wind up being short. If it inherited the stallion’s growth gene, it will likely be tall. This does not mean that the offspring will be the exact size of one of the parents. It means that one or the other of the genes-tall or short-will be expressed, and it is unlikely that the resultant foal would wind up midway between its parents in size. Analysis of data showed that bigger, older, and multiparous mares had larger foals than smaller, younger mares foaling for the first time. The foals from larger mares were taller and heavier and had greater thoracic perimeters at birth and also at 7 and 30 days of age. Older and multiparous mares also produced heavier placentas, which is possibly related to the better ability of these mares to allow the uterus to expand during pregnancy. Fetal nutrition is provided by the placenta, and a small or poorly developed placenta may be less able to deliver nutrients and support fetal growth. There were no significant relationships between sire characteristics and neonatal foal characteristics for the horses in this study. Or this article in the journal Reproduction – “The influence of maternal size on pre- and postnatal growth in the horse: III Postnatal growth” by W R Allen, Sandra Wilsher, Clare Tiplady and R M Butterfield, which compares the outcomes from ‘restricted’ in utero existence with ‘luxurious’ in utero existence, and concluded their were enduring differences in size but these were not statistically significant. Check this range of views and evidence about size of mares, sires and foals from this (archived) forum. And at the other extreme here is the 2008 masters thesis on NZ thoroughbred mares by Luciana de Freitas Aiex. What seems to be common ground is that the size of the mare’s uterus does have a big influence in most cases the size of a foal at birth, and that is nature controlling things so a mare is not damaged during birthing (although this is not necessarily a fail-safe as we know). And most studies seem to show that foals born smaller often don’t take too long to catch up. The initial size on the ground is not what will determine how big they grow in the end. “A longer bodied wide ribbed mare will give more room for a foal to develop than a short bodied narrow ribbed mare will. There are always variables such as proper nutrition and mare care. Once the foal is born, again, proper nutrition, worming and other necessary vet type care are will affect the size of the foal. However after that, the final size of a foal seems to be a mix of a range of factors.” (including genetics). As most breeders will tell you, it is better for a broodmare to have a longer and wider body than to be narrower and short-coupled, regardless of her height. In other words look for SHAPE rather than size. 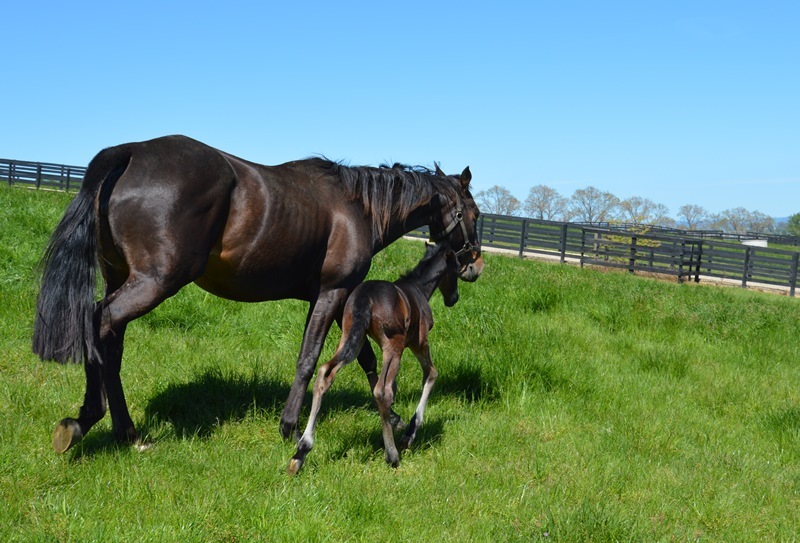 The wellbeing of a mare and foal during the whole process of pregnancy (and in particular the proper nutrition of the mare during her pregnancy) and the raising of the foal are just as important in building a horse to the best size it can be. Michele Carson is a long-time breeder, for many years in partnership with Tony Milina, and is one of the few who try to survive without an additional income. She describes herself as “crazy” for trying but it is a passion that endures and by focusing on quality she has had a good degree of success. Again, her word for it is “lucky” and while that is true of how she and Tony came to get the founding mare Cinnamon Toast, it is much more than luck that grabs an opportunity and builds it into a successful family. While Michele is still breeding from that family, she also has added a few more mares along the way including Black And Royal (by Elsu) one of the last foals of Spirit Of Venus; the trotting mare Strapless (by Straphanger); and more recent purchases being: the Christian Cullen mares Panforte (the dam of Grumpy Possum racing successfully as Ima Grumpy Possum in Australia) and Divine (who is a daughter of the very good broodmare Sokys Sunday). Michele is also now a co-owner the trotting mare Aspiring Monarch (who is an unraced full sister to Royal Aspirations). Her cornerstone broodmare has been Toast Of New York, a New York Motoring daughter of Cinnamon Toast, and subsequently her two daughters Bury My Heart and Follow My Heart – and potentially the youngest daughter Show A Heart, currently a small but lovely striding 2yo by Big Jim. Of those, Bury My Heart was very successful on the racetrack and has been a gem in the breeding barn to date, producing the very good Texican as her first foal. Bury My Heart is an In The Pocket mare, and Michele has stuck to the In The Pocket cross with Bettor’s Delight for the next four foals – and the mare is due to give foal late this season to the sire again before possibly trying Somebeachsomewhere. Texican is now doing his racing in North America – and just last weekend added another 1st to his list, bringing his total earnings to $549,104, a best time of 1:50.3 and 24 wins. He is competitive in very good quality fields, and has developed from a winning 2yo in New Zealand to a successful all aged pacer in the United States. Texican N, from post position No. 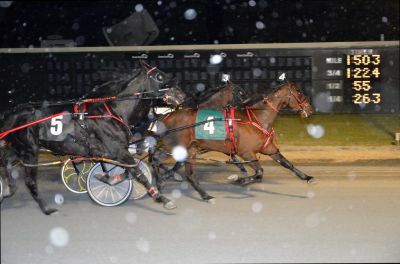 3, won the weekly pacing feature. Sitting pocketed to 17-10 choice Michael’s Power (Bartlett), he then held off a three-hole The Real One (Pat Lachance) by a nose in 1:52.3. The favorite decided to retake from the eventual winner (:27, :56.2, 1:24.4) passing the first substation, but faced in the lane. Frankie’s Dragon (Sears), Michael’s Power and Take it Back Terry (Brennan) came away with the lesserloot. For second choice Texican N, a 7-year-old Down Under Bettor’s Delight gelding trained by Peter Tritton (three winners Saturday) for owner Harry von Knoblauch, it was his fourth win in 22 ’15 tries. The Pocket) O-Harry von Knoblauch. B-Mrs M Carson, NZ. The mare’s 2010 foal was a compact but attractive full brother to Texican who went through the yearling sale ring as “Derringer” and sold for $22,500 but was immediately renamed Strawberry Heart by owner Strawberry Pastoral Ltd. He has ended up in Australia after looking like he had early potential but hasn’t gone on with it. Michele didn’t give up on the mare or the name! After missing to Art Major, she sent the mare back to Bettor’s Delight for another colt – and named him Derringer once again. A Derringer is the pistol that the wilder ladies of the West used to hide in their knickers and garters in case of trouble! 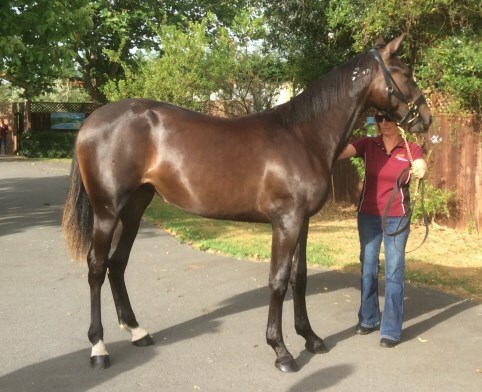 The colt looks promising, having sold for $75,000 at the 2014 yearling sales, qualified as a 2yo and having just three starts for a 2nd for trainer Mark Jones – the last start was an eye-catching 4th at Addington yesterday (Friday 8 August 2015) where he was badly checked and ran on very well. The latest foal from Bury My Heart is the Bettor’s Delight filly Capture My Heart who is entered for the 2016 yearling sales at this stage, but it will depend on what the mare foals this season. Toast Of New York’s daughter Follow My Heart, a 4yo Mach Three mare, has just started on a breeding career and is in foal to Betterthancheddar – a son of Better’s Delight from a Hall Of Fame mare Lady Ashlee Ann. Another daughter, Toast To Cullen, is a broodmare for Biddlecombe Equine Ltd and has done a very solid job so far. Toast Of New York’s last foal is a colt by Sir Lincoln who has just turned a yearling and is a nice attractive type, Michele says. Toast Of New York is a 24yo and in great nick – the dam of 14 registered foals, and now enjoying her retirement. Michele’s trotting mare Strapless was on the market briefly with a Angus Hall foal at foot, but Michele retained them in the end and the result is the talented Angus Bolt. Michele has since bred the mare twice to Majestic Son. 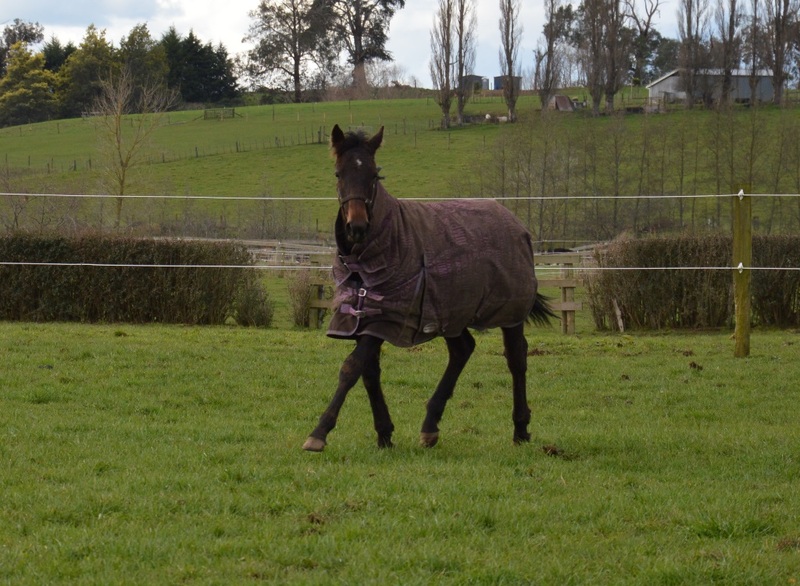 She has also bred and sold a Majestic Son filly from trotting broodmare Aspiring Monarch, and the mare is back in foal to the same sire for co-owner Shane Hayes – on an alternate foals breeding arrangement. Black And Royal is another broodmare Michele has – although she may look to moving her on in future – and was one of the first Elsu mares to have a yearling in the sales. That was the Mach Three gelding Jack Black who has 5 wins to date in Australia. Since then there is a 4yo Christian Cullen gelding Hard N Fast who was bought for $40,000 by Paul Court and has been at workouts and trials as a 3yo but yet to get to the races. This year her Christian Cullen filly Game Of Thrones sold for $25,000 at the yearling sale to Australian interests. A Well Said colt was sold to John Street for $10,000 at this year’s weanling sale, and the mare is foaling this season to Raging Bull, a horse that Michele saw in the flesh as a racehorse and regards as one of the finest looking horses she has seen. It’s not all plain sailing as a breeder, and Michele can vouch for that. She lost four foals in one year in 2013, all potentially very commercial including a Somebeachsomewhere foal from Bury My Heart. The emotional and financial hit was hard, and the reasons were random and varied – two born dead, one with a twisted leg and one with an inoperable growth. So the highs of successful results are always tempered by others that are just average and some that are simply tragic. As an industry, we are lucky to have “crazy” people like Michele Carson who are very astute and passionate breeders and who provide quality racehorses year after year. There is a lot you can learn about your mare’s family by looking back at its roots and then following the development of its various branches, and finally looking forward to new talent coming along. It can help identify which connections might add value, or where the overall family seems to be going. And it may well show how hard it is to duplicate outstanding individual traits simply by repeating a cross. But researching your mare’s family isn’t just about scanning the pedigree pages. It’s also about scanning the race fields in your Best Bets! Or checking out what’s at the workouts and trials. Recently I’ve been following some racehorses from my own mares’ family – the Zenover family, of which I have Zenterfold from the Zenola Star (New York Motoring) branch. At the workouts in Cambridge on 1 August, and indeed the previous week, a very nice looking horse called Spyda (Mach Three x Elsurah) won his learners pace, leading them in a crawl and sprinting hard for the last 400m. Elsurah is a full sister to the great Elsu (Falcon Seelster x Interchange). She raced briefly as a 3 and 4yo, just 5 starts for a second, before starting her broodmare career. Elsurah is very closely related to my mare Zenterfold, the dam of Tintin In America et al. Zenterfold’s grandam Now And Zen is a half sister (by trotting sire Chiola Hanover) to Interchange. Not only that, but New York Motoring appears as the sire of Interchange and as the sire of Zenterfold’s dam Zenola Star. Spyda, owned by Sean McCaffrey, Schnapps Bar Syndicate, A Learmonth, Betty Newcombe, and trained by Sean McCaffrey, in the prelims before his learners pace workout at Cambridge. The wider Zenover family includes top performers like Copper Beach (dam of De Lovely), Revonez, Motoring Magic, Zenad and of course Elsu and Tintin In America, as well as a raft of other solid performers like Zen Zan, Zenable, The Blue Lotus, Destination Moon, Zenola Seelster and Zena’s Art. But like every big family tree, there are branches that seem to be dead ends, and others that have strong buds emerging, as well as those branches that are the reliable croppers. Future interest also lies in some widely diverse female lines which are producing the next generation both here and in Australia. Inevitably, because of the Elsu factor and to some extent with Tintin In America being by McArdle, another son of Falcon Seelster, almost every branch is dotted with attempts to duplicate that success by crossing with the Warm Breeze sire line. But in many cases, the results have been less than spectacular in terms of racing performance. I’m not saying that breeding to a sire (or his sons) that has had success with the family is a bad idea. Not at all. But it certainly is no guarantee of immediate success, and it shouldn’t stop you looking elsewhere if another sire seems to bring more to the match in some way. Following successful crosses very closely can give very different results. Again, in the family I am most familiar with, Zenterfold has an In The Pocket full sister Zenola’s Princess (qualified as a 3yo, not raced). She has been bred twice by Bruce Greenhalgh to McArdle to get a brother in blood to Tintin In America (Zen Warrior, 4yo, 9 starts for 1 win, 2 places to date) and a sister in blood (Zena Mac, 5yo, 50 starts for 2 wins, 17 places to date). So more later developing types, unlike the precocious early ability of Zenterfold and Tintin In America. Dare I predict that Zena Mac will become a very good broodmare after a couple more wins? And Zen Warrior will build a bit more strength this season. I’ll follow them both with interest. Another from the family that caught my eye and gave me a nice return on my TAB investment on Friday night was Zenmach (Mach Three x Zenardle) who won a 2yo race at Addington on Friday night and paid over $17 for the win! Zenardle is a grand-daughter of Now And Zen (from the Sokys Atom mare Zenara) and as the name suggests, her sire is McArdle. I blogged about Zenardle when she was one of the first McArdle mares to have progeny at the yearling sales in 2012, and she’s gone on to do a good job – that first foal of hers at the yearling sale was Zenable, who is now a 6yo Bettor’s Delight mare racing in Australia with a total of 18 wins, 19 places and over $170,000 to her name (and another a great broodmare prospect). Her next foal is Jeremy’s Jet gelding Elroy Jetson who is also in Australia now with 5 wins to date. And her third foal is Zenmach with just two starts for a win. So this is another instance where the attributes of the family cross with Falcon Seelster/McArdle may be adding value in a subsequent generation. One of Zenterfold’s own daughters by McArdle (bred by Aria and Geoffrey Small) was on the market recently as a broodmare, having been only lightly tried. She was bought off the Smalls for a very good price as a weanling, but the real rewards may be downstream for a breeder. Both Spyda and Zenmach are by Mach Three. Does this indicate any potential click with the family? My guess is that it reflects more the sense of going to a speed sire like Mach Three for a mare that lacked that speed herself. A couple of other “young bucks” from the family that look to have some potential are Zach Maguire (3yo Bettor’s Delight colt bred by Ray and Diane Kennedy from Zenola Starbuck, a Christian Cullen half sister to Zenterfold). He was sold for $34,500 at the 2014 yearling sales. His older brother Zin Zan also shows a lot of speed and promise. Incredibly their Rocknroll Hanover half sister Angie Maguire was passed in at this year’s yearling sale for $15,000 – you would have thought she was worth double that in broodmare prospects alone. From my own mare The Blue Lotus (Grinfromeartoear daughter of Zenterfold), I’m looking forward to seeing her first foal, a filly by Bettor’s Delight called Amazon Lily, make her debut this season. And I’ll be watching for Thephantomtollbooth (Real Desire x Zenterfold) to develop into a nice 3yo as he learns and strengthens. If you have seen something (or have bred something) from the Zenover family that looks promising, share it here.